Ten years since his first book, Fred is still taking the "Quantum Leap." This time he leaps into the human body - a universal subject since every reader is guaranteed to have one ( or most of one). 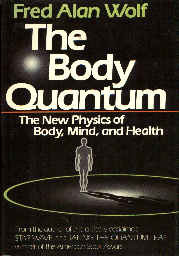 The subject is applied quantum physics - applied to the body. The center of the book is devoted to how the various components of the body receive and exchange energy with their surroundings. If you've ever wondered how the energy in a peanut butter sandwich gets transformed into the motor energy of hogging, this kook's for you. If you've ever wondered why the first ten pounds on a diet come off so much quicker than the last ten pounds, this book's for you. If you'd like a computer program that would tell you the exact amount of food and exercise that would permit you to achieve your ideal weight and stay there - this book's for you. Once Wolf has explained away via physics the mysteries of molecules and metabolism, and just when you think he's about to explain away the process of consciousness the same way, a curious event is observed: the `observer effect' raises her beautiful, enigmatic head. We discover that behind all the materialistic rigmarole of physics lies the concepts of quantum mechanics that can only be termed spiritualistic. What we think and imagine in consciousness becomes a reality as we observe it. At the root of the probabilistic outcomes is a single consciousness, one that, by observing the outcome, collapses the wave function of probabilities into one of many possible outcomes. In the many-world theory, when an observation is made, the world divides into two parts: in one part the cat in Schrödinger's box is hale and hearty, and in the other world the cat is dead. Thus the living go one living in one world and only appear to die in the other worlds. A difficult book, but one well worth the effort of study.